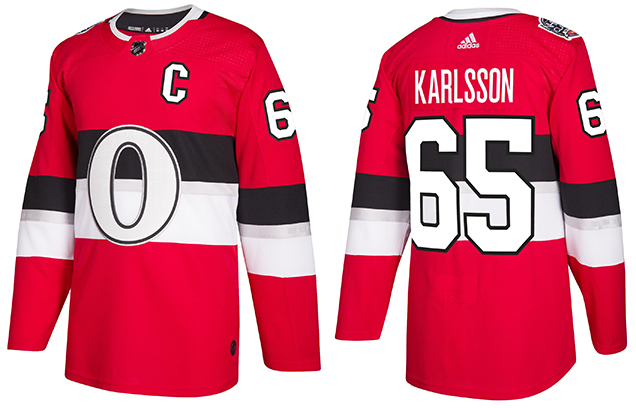 In addition to the Winter Classic, the Senators and Canadiens will play outdoors in the NHL 100 Classic on December 16th at Lansdowne Park in Ottawa. 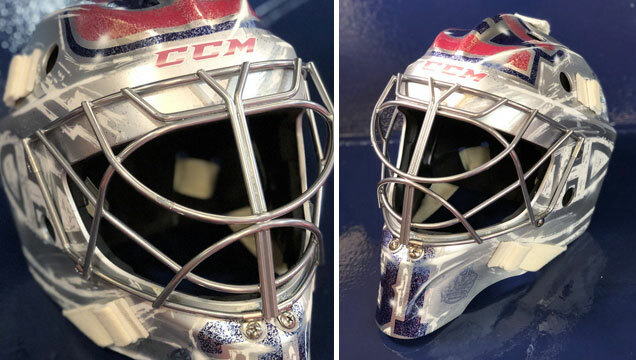 We’ve already seen the Habs and Sens jerseys for the event, and masks have started to be unveiled for the outdoor classic, including the masks for Price, Anderson, and Condon. 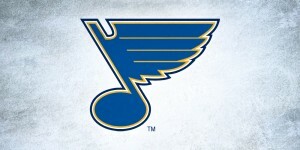 Keep checking back as we break down the rest of the masks as they’re revealed! 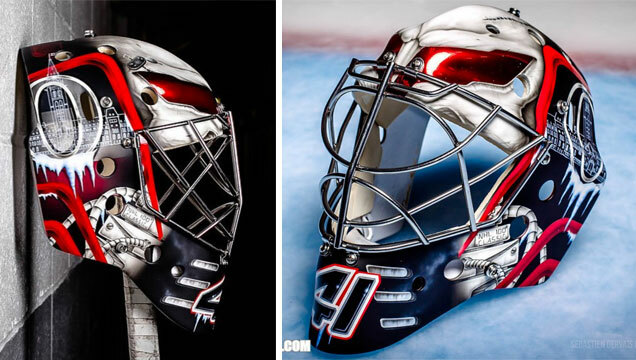 Mimicking the silver-trimmed sweaters for the outdoor game in Ottawa, Carey Price’s NHL 100 mask sports a shimmery, frosted facade perfect for a winter wonderland showdown. The pointillism effect makes up a large Canadiens logo on the top of the mask mirrored by textured logos in an icy style on each side. 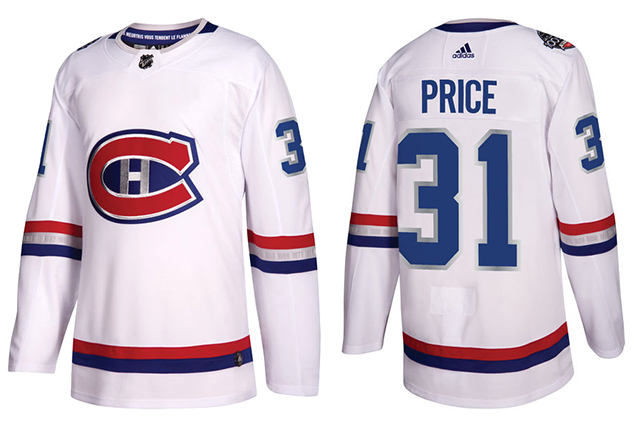 Price’s number on the chin is framed by two NHL 100 Classic logos, and the team’s name is stenciled over the top in a typeface analogous to the years on the jersey sleeves. 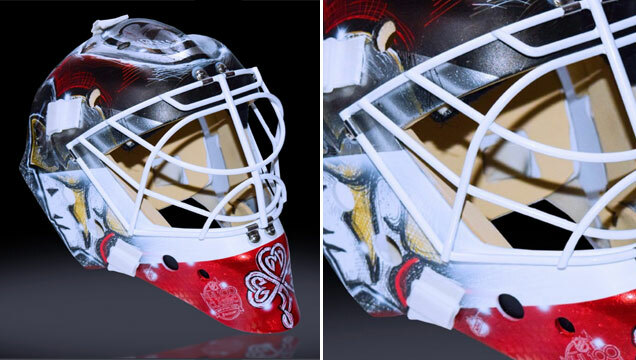 Price usually stays fairly conservative with his mask designs and leaves a heavy focus on team branding. 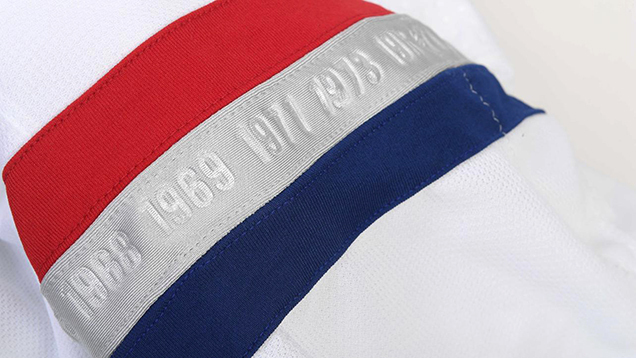 This bucket is no exception, using the classic Canadiens’ logo colors with a metallic and frozen twist. Artist Sylvie Marsolais and the Senators revealed the first photos of Craig Anderson’s NHL 100 mask following a teaser video on the artist’s social media accounts. Sticking with Anderson’s signature Corvette theme, Marsolais mixes traditional and slick styles in this crispy and unique color-changing paint job. 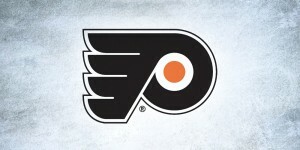 A transparent rendering of the Senators’ “O” logo appears on both sides of the symmetry-driven mask, dripping in icicles and screening a blueprint-style drawing of the city’s architecture. This is a great piece in Anderson’s series of Corvette-themed buckets, marrying the netminder’s passion for cars with imagery and style appropriate for the historic outdoor event. 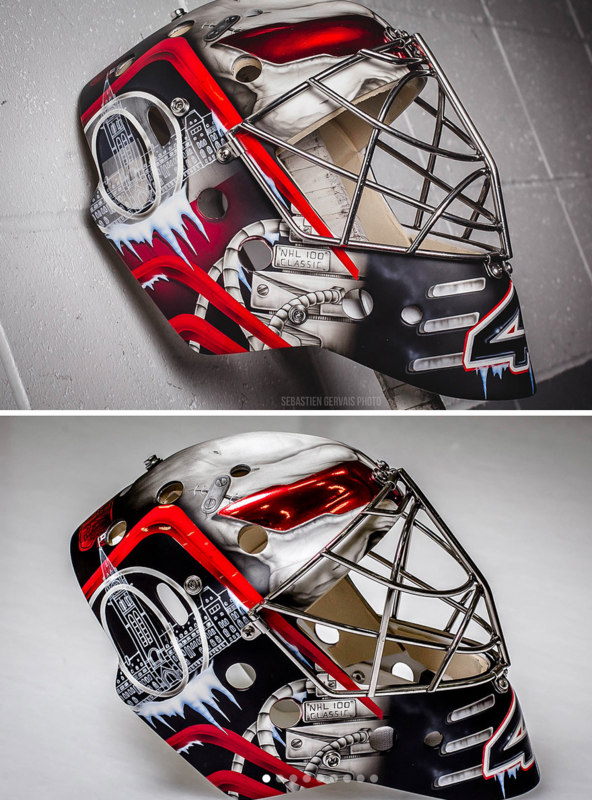 Also revealed along with Anderson’s new bucket was Mike Condon’s mask for the outdoor showdown. 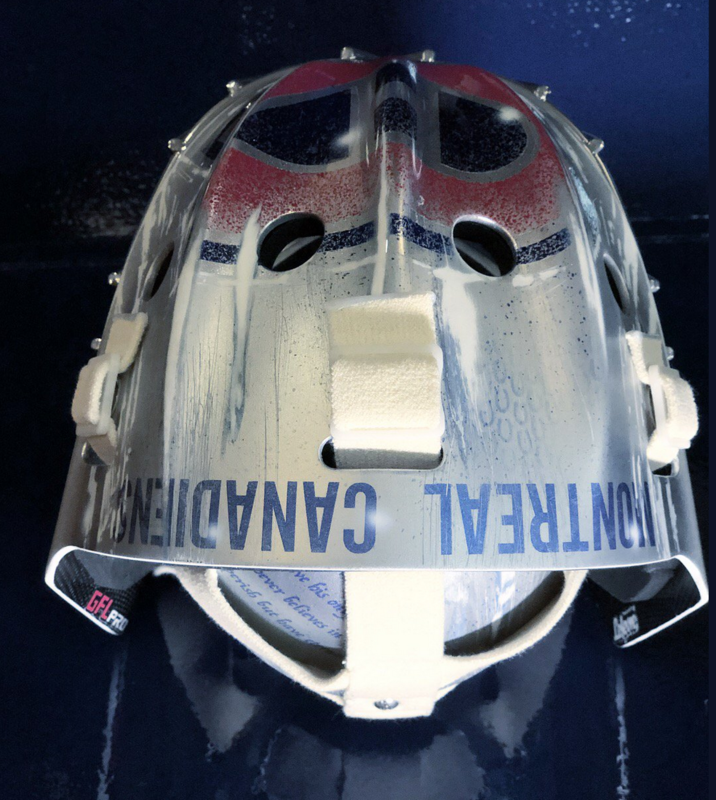 A 4D textured design painted by Dave Gunnarsson, the Senators shared a first look at Condi’s mask featuring the retro Senator logo and a Celtic clover on the chin. 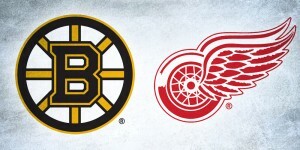 What do you think of the NHL 100 Classic masks? Let us know in the comments, or on Twitter or Facebook!